Heat oven to 400°F. Spray large cookie sheet with cooking spray, or line with cooking parchment paper. Unroll dough onto lightly floured work surface. Roll dough into 12x14-inch rectangle. Using pizza cutter, cut dough lengthwise into 4 strips. Along long edge of each dough strip, spread 2 tablespoons of the cheese. Stretch dough over filling; brush edges with water, and pinch to seal. Pick up ends and gently stretch each dough rope to 24 inches long. To make pretzel shape, form each rope into U shape. Twist ends twice. Press down dough where dough overlaps in an “X.” Pick ends up and fold over so they rest over bottom of U shape. Tuck one end under dough at bottom of U shape; other end lies over dough at bottom of U shape. In small bowl, beat egg and 1 tablespoon beer with whisk until blended, set aside. In large microwavable bowl, microwave remaining beer uncovered on High 1 minute 30 seconds or until hot. Slowly add baking soda; stir until dissolved. 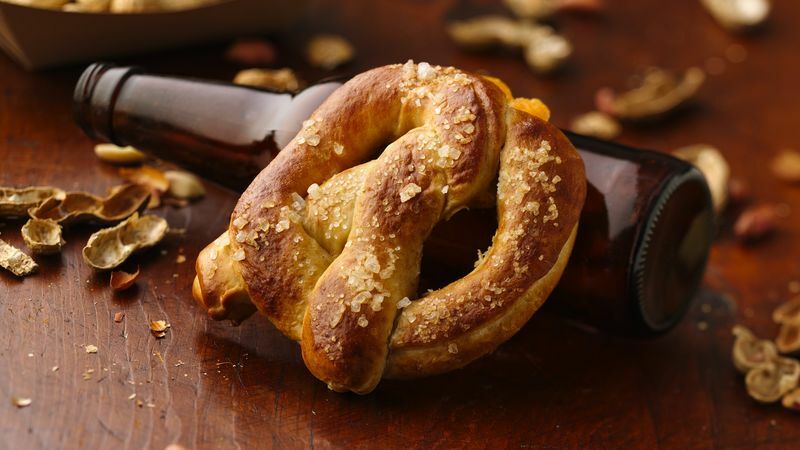 Dip each pretzel,1 at a time, into beer and soda mixture. Remove with large pancake turner or slotted spoon; place on rack. Let stand at room temperature 5 minutes. Brush pretzels with egg mixture, and sprinkle with coarse salt. Carefully transfer to cookie sheet. Bake 11 to 15 minutes or until tops of pretzels are dark golden brown.